Back when I decided to start an antique booth in 2013, I didn’t hardly have a clue what I was doing. All I knew was that I had painted some furniture and I didn’t want to sell it on Craigslist or Facebook (for so many reasons). I called a few stores, found one near me with an available booth for a reasonable price, and started taking pieces there as soon as they were finished. I wish someone had given me advice in the very beginning so I could’ve avoided much of the learning curve that goes into running a successful antique booth. 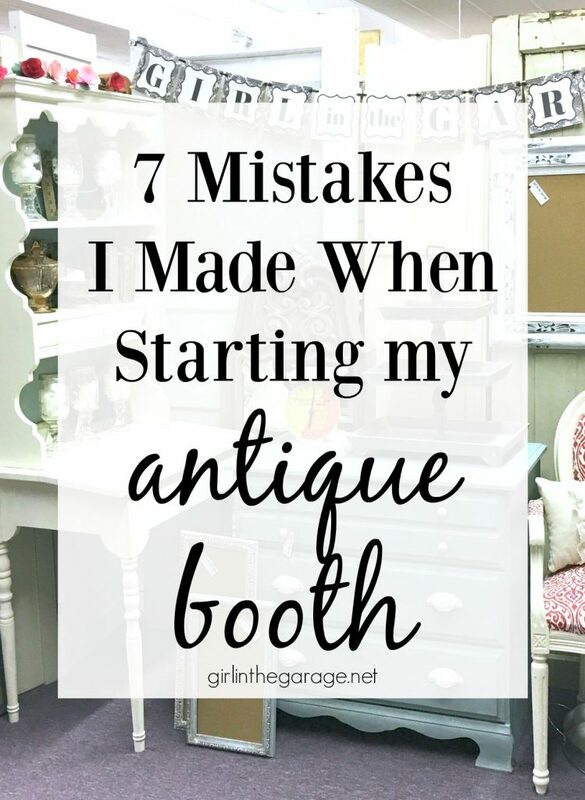 That’s why I’m hoping you can learn from these 7 mistakes I made when you start an antique booth. I don’t consider myself an expert, but I do know a heck of a lot more than I used to! 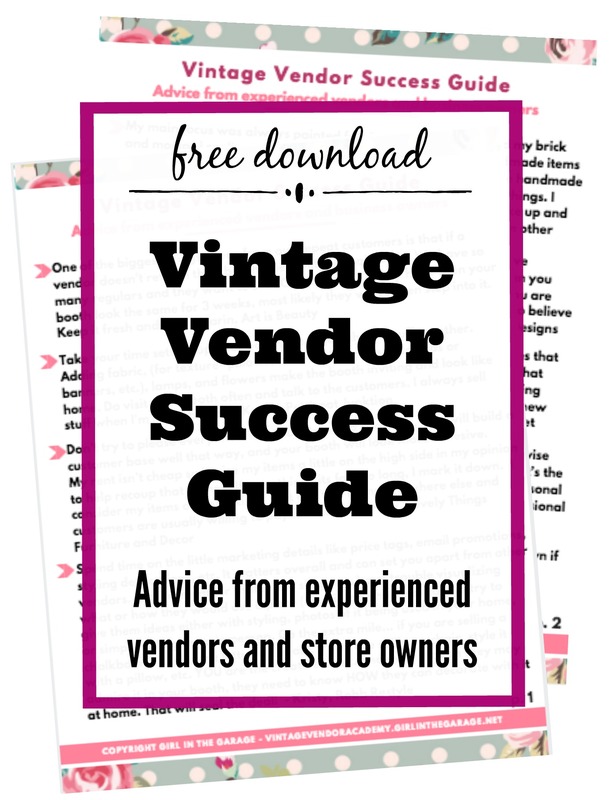 And at the bottom of this post, you can also request my free Vintage Vendor Success Guide with even more helpful advice from experienced vendors. 1. Not doing hardly any research first. I thought I could call a store near me, rent an available space, and people would come buy my stuff. Turns out, there’s way more to it than that. Finding the right store is crucial to your success. It may not be the closest store geographically, it might not have the cheapest rent, and there may not even be any spaces available if it’s a really popular store. I was on a waitlist for a year before getting into the store I’m in now. Do research on all the stores within a reasonable driving time – that may be 20 minutes or an hour away. How far are you willing to travel to have a successful booth in an amazing store? Make sure you can commit to driving there weekly, or as often as needed. Visit the stores and really look closely. Choose a store that’s aligned with your style – make observations about the booths, the products, prices, even the employees. 2. Thinking I had to sell only my upcycled furniture and nothing else. Maybe you have one thing you focus on – refinished furniture (or whatever your specialty is). 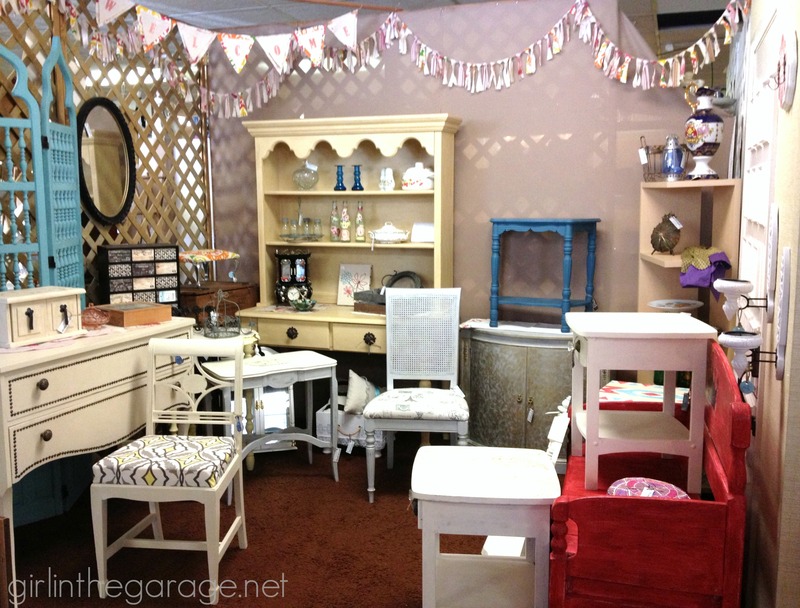 Your booth will still look pretty empty if all you have are some chairs, tables, and dressers. 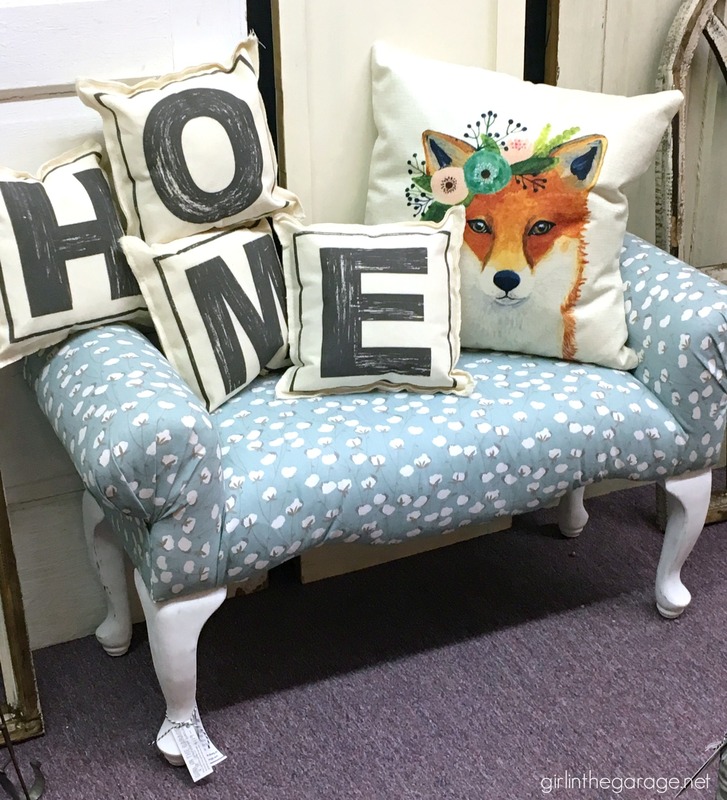 Think of other products to sell that are still within your main category (mine is home decor) – upcycled frames, painted crates, handmade pillows, candlesticks, jewelry boxes, etc. Try to offer items of all sizes and price points – your booth will look fuller and you are guaranteed more sales. Not everyone walking by your booth needs a new piece of furniture right now. When I started my very first booth in 2013. 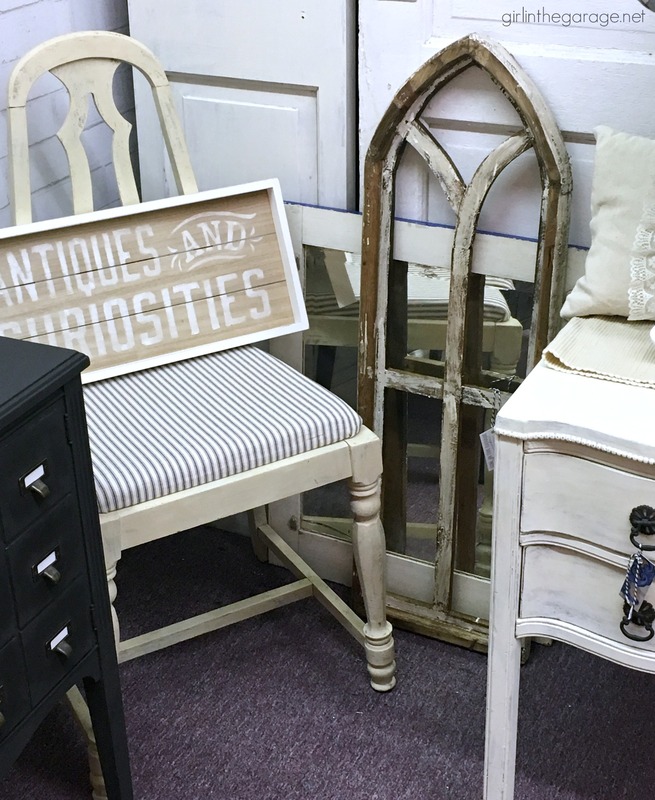 When you first start an antique booth, it’s tempting to price low so you’re guaranteed some sales right away. You might be thinking “No one knows me or my work, so they won’t be willing to pay much.” If that’s in your head, please stop it. Don’t undervalue yourself, the time and effort you put into your work, just for a quick sale. You don’t want to start with a reputation for cheap prices. If your pieces sit for a while without any interest, then you can offer a temporary discount. 4. Letting the store do the marketing for me. The store should absolutely be doing some consistent marketing. But with 50-100 vendors, they can’t give everyone frequent shoutouts on Facebook. You are in charge of the success of your own business – that means having your own Facebook page and probably even Instagram too. Grow your own following so you can let fans know when you bring new pieces in, when there’s a special sale, or even when you’re working on new projects that will be available soon. 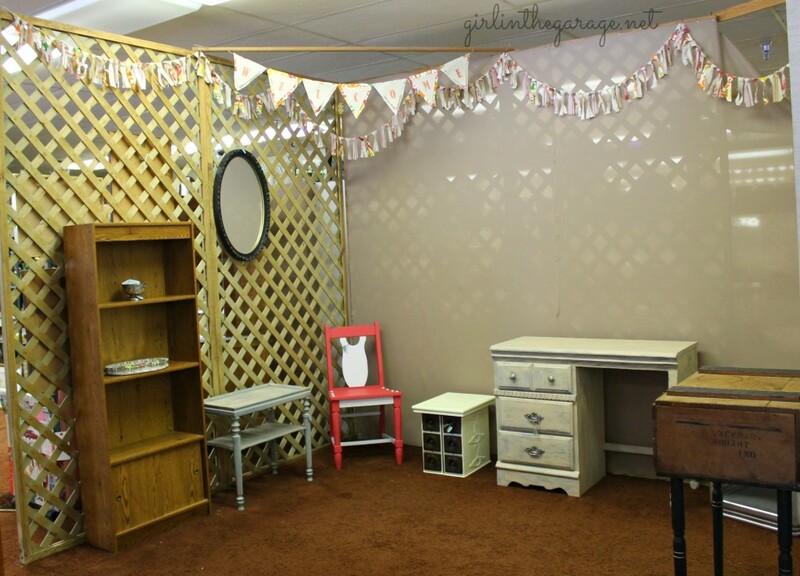 My antique booth after having it for one year – 2014. This is something I struggled with for a long time, and I get emails from others who are having the same fear. There will always be critics. There will always be somebody more experienced than you. And there will always be a reason to procrastinate and be nervous to start your business. If this is really your passion, don’t let fear or doubt or unsupportive friends get in your way. Take a deep breath and do it. You’ll learn quickly and you’ll become more confident. You owe it to yourself to try! My very small booth (7×3 ft) when I finally moved to a different store in 2017. 6. Not creating a brand from the very beginning. 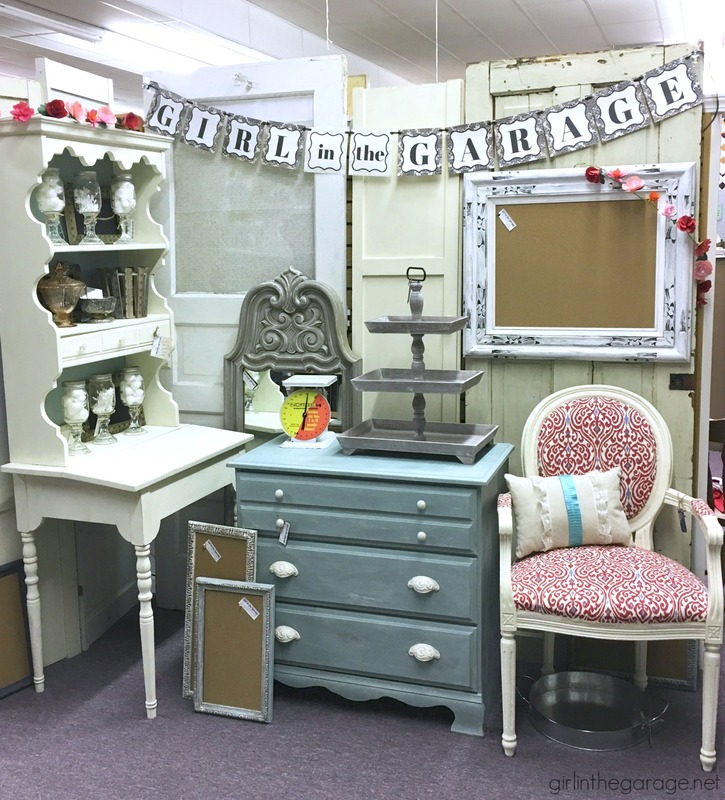 When you start an antique booth, it helps to have a cohesive style from the beginning. My pieces were kind of all over the place design-wise and my booth wasn’t decorated well. Now, I treat my space like a little boutique. I want customers to feel a certain way when they walk in and I want to leave a lasting impression. My space, my merchandise, and my branding are all cohesive because I take it way more seriously as a business now than when I started and it was more of a hobby. Want to learn more about selling refinished furniture for profit? Click here to learn about my exclusive series: Vintage Vendor Bootcamp. 7. Not visiting/rearranging my space often enough. Life sometimes gets in the way, I know. 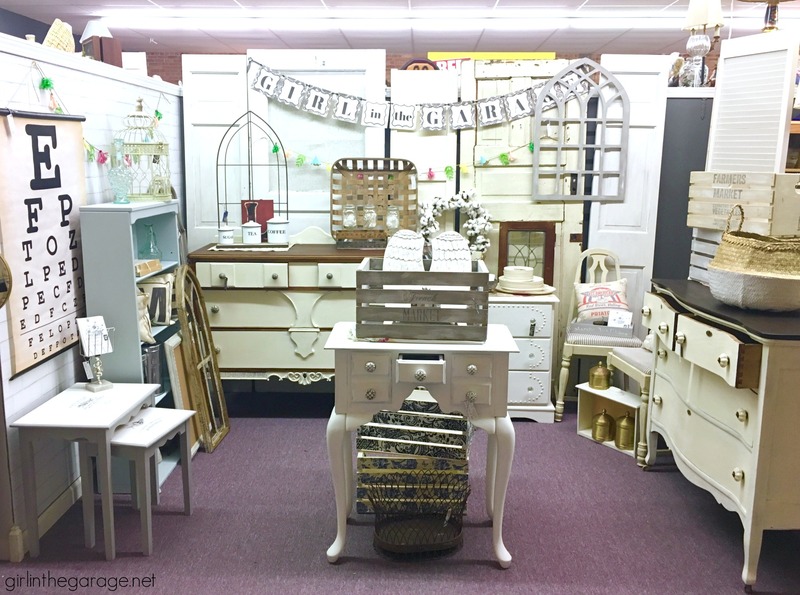 But the more often you bring in new items and rearrange your booth, the more sales you’ll have. Don’t treat your booth like a storage unit, dropping things off once a month when the rent is due and not checking in again until the next month. 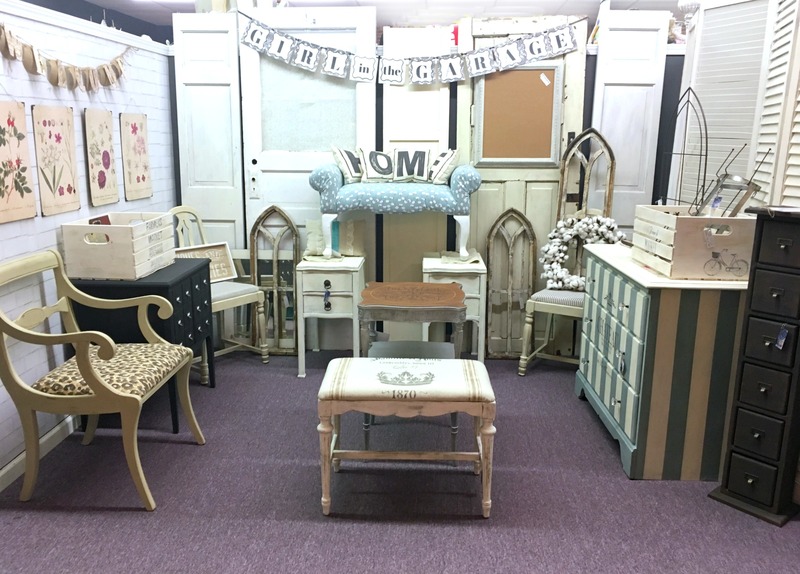 The more time and effort you can commit when you start an antique booth (and for as long as you keep it), I guarantee you’ll have more success. My booth in June 2018. My booth in March 2019. Part of my current booth – 2019. 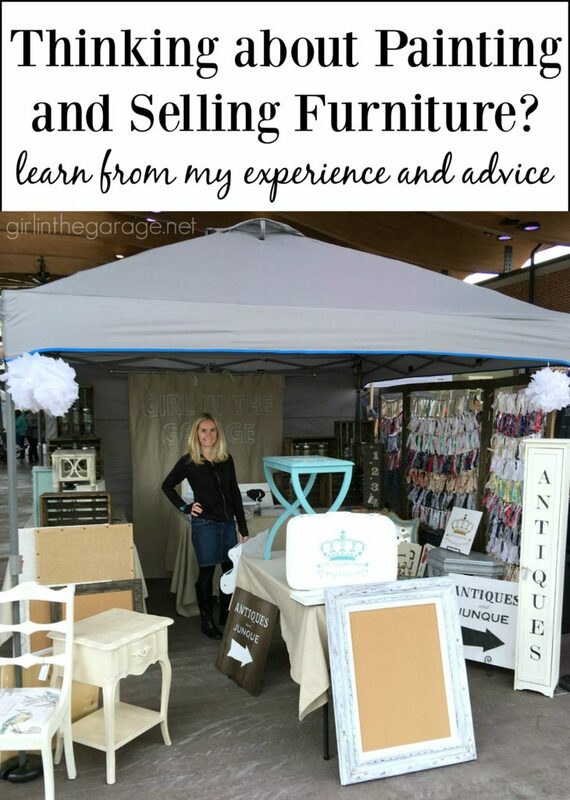 I’ve also created a free downloadable Vintage Vendor Success Guide with two pages of advice from experienced vendors at antique stores, markets, and even shop owners (see below). Click Here to request the guide now. Free Downloadable Success Guide: Enter your email below to receive printable advice from experienced vendors and shop owners. Success! Now check your email for the free downloadable guide. Thank you, thank you for sharing your knowledge! I’m not quite there yet but very interested. It’s easy to forget to record cost of goods, costs in refurbishing, etc. I highly recommend an inventory control system, and I love Airtable.com (and the Airtable app) to keep track of everything. As soon as I make a purchase, I record the purchase information, and take some pics through the app so I don’t forget something. If I’m working on my PC, I can access all the information on it, as well. It’s a free service (up to 1,000 records), and is a completely customizable database. You don’t want to inventory extremely cheap items, not worth your time. I personally inventory items priced $10 and over. As they sell, I enter the information like cost of goods, expenses, and what it sold for in my accounting program or spreadsheet; then I delete that item from Airtable. Yes, this is double entry. However, I always have my inventory information and pictures in the palm of my hand. Very very nice! Good job on your presentations. It was interesting to see how you progressed from the beginning to present day! i’m still in the dreaming stage, but requested the download! I love your posts! thanks for all the good information! Getting ready for my first fair. Thanks for the advice! I’ve been contemplating this for years. I appreciate your helpful information. I’ve just got to get passed that fear!!! Great article. I am on the fence also. I think maybe when I retire in about 5 years I might try. I see you have been successful because so many things have sold.You do a very good job of displaying your wares. I really like the botanical prints you have on the wall. On the fence….but you have encouraged me with your post! Thank you so very much for the information…it really does help to make me feel maybe I can do this! Good basics. I did it for about 1 1/2 years. 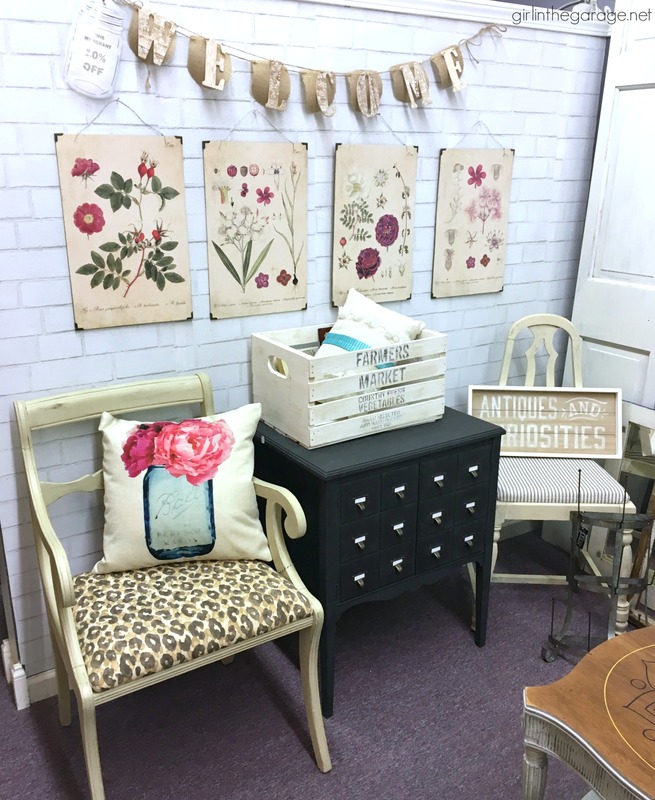 Had lots of smaller decorative items and small furniture. In my area there is ton’s of competition for selling space, items to sell. Being far away fm store is totally inconvenient. Arranging, rearranging will take 3 times longer than you planned plus Hauling things in is a lot of work. There was a certain amount of theft (some of my more potentially profitable items) because staff was overly busy or could be distracted away from sales counter to help a customer. Business can be very inconsistent sales wise as you complete with every sale site, thrift store, Craigslist, holiday season, etc, etc. I have done much better selling on CL, online garage sale sites. Love the article. My husband and I are at the point where we are looking at places to sell our items. I have painted quite a bit for our house and have sold a few items to friends and family. We have been looking at a few places to rent a space. Questions we do still have are Do we need a business license, giving our business a name and all the legalities and taxes? Do you have information on that? Great information! I have had my booth for 1.5 months and am enjoying the experience! I had been looking for the right opportunity for almost a year until I finally cleared a waitlist for a booth. I had plenty of inventory by the time I moved in and keep it stocked with things I have picked as well as my own upcycled designs. I did a fair amount of research before I dove in but I’m still learning tips and tricks to this market. Thanks again for sharing your experience! LOOOOOOOOOOOOOOOOOOOOVE the new look of your site! Haha, thank you! I’ve been working on it today and there are still a few kinks to work out. 🙂 I’m excited to finally have a new look. Thank you for the Vintage Vendors Success Guide! I am waiting for a space to come available at a wonderful Antique Mall but I’m afraid there is a long wait. They did have a section of glass shelves open and I took them. It’s frustrating not being able to display large items though😕. Your 7 mistakes opened my eyes and helped me to feel more confident. One thing I do is make sure my price tags are secured on my items so I won’t miss a sale. People do not like to have to ask for a price. Good luck in your business. Mistakes are inevitable but what’s important is that we learn from it and be better in the future. Thank you sharing that experience of your to raise awareness to people who plan of doing the same thing you did. Another good thing in this article is that you got to recognize your mistakes and rise back up against it, such a good attitude. All the best!